kdev-python provides Python language support for the KDevelop integrated development environment. For more information, please look at the 1.4 and 1.5 release announcements, and especially make sure to watch this short demonstration video! This is a rather minor update and I recommend it to everyone running 1.5. There’s one thing I forgot to announce in the 1.5 release: PEP8 checking support (which was actually a good thing, since it was rather crashy until now ;)). 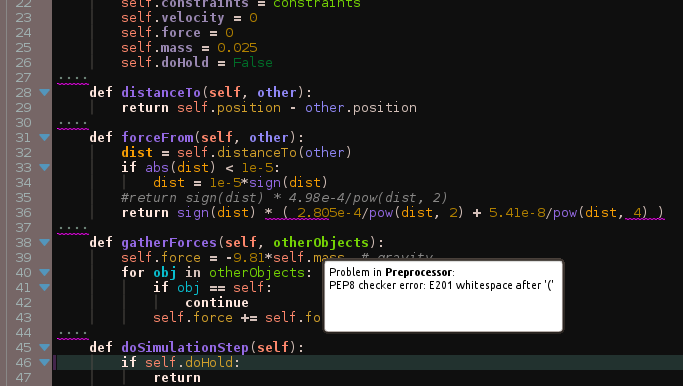 It will run the PEP8 style checker whenever an open file is modified and display all errors inline (if you have inline error display enabled) and in the Problems toolview. By default it is disabled though, since it displays a lot of errors for people who don’t follow PEP8, so if you want to use it, go to Settings — Configure KDevelop — PEP8 style checking (the change will only apply to newly opened or modified files). If there’s any issues, please make sure to let me know on the bug tracker. > This is pretty awesome. > is there any way to give you more tangible thanks? Hi, can I ask how to use this plugin? My systems is opensuse 12.3. I have installed kdevelop and kdev-python. I build a "simple python application" project, and edit a .py document. But the python-plugin seems not to work and I can use only the basic function of the text editor. Verify that you have matching versions of kdevplatform and kdev-python (e.g. 1.4.x of both, or 1.5.x of both). Your package manager should do that for you, but you should still check. If that's not it, you might need to run kbuildsycoca or reboot your system after you installed the plugin. Also check if the plugin is listed in Help -> Loaded plugins. If that doesn't work either, tell me and we can debug it further. After rebooting, it works perfectly! Thank you for your response and such a great plugin. I've tried installing a couple times on Fedora 19 (just installed) and I'm not having much luck. The install throws some warnings about "‘PyArg_ParseTuple’ is an unrecognized format function type [-Wformat=] PyAPI_FUNC(int)" That I did not see when I installed on Fedora 18. But everything does seem to finish successfully. I've tried rebooting and kbuildsycoca but it still doesn't show up in the loaded plugins. I followed the instructions in INSTALL – which worked for me fine before. A quick question – if I want to start over – and remove all that I've just installed – is there an easy way to do that or would I need to look over the install, see what files were put in place and remove them? I figured out the uninstall part – super easy. kdev-python is awesome, i just jan get pep8 to work. The selected PEP8 syntax checker "/usr/bin/pep8" does not seem to work correctly. Hmm. Can you run /usr/bin/pep8 in console? What happens? What does /usr/bin/pep8 –version say? Weird, it works in new project, anyway, needed to use path mentioned above.